Sportfishing in Kyuquot BC and limited out? Staying at a lodge or visiting local friends and want to get out and play? Boat-based camping in the area and interested in trying something different? 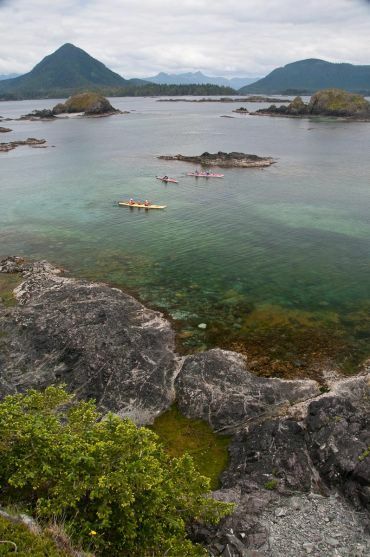 Looking for an incredible sea kayaking experience in Kyuquot, BC?!! Join us for a day tour. We have day trips happening most days of the summer from our sea kayaking Wilderness Retreat base camp on Spring Island. We'll customize the perfect kayak day tour for you and your group, designed around your previous experience, interests, and abilities...and what the weather, sea conditions, and wildlife seem to be serving up! These day trips begin and end with water taxi transportation from your accommodation in the nearby Village of Kyuquot. This scenic boat ride often blasts through some of the same areas we'll explore at a more peaceful "connecting" pace by ocean touring kayak. We provide all of the kayaking equipment, a delicious lunch, and professional kayak guides who aren't happy unless you're happy! The day can begin with and include as much instruction - be it from square one or a refresher - to ensure your focus is less on the kayaking and more on the rich surroundings. Our lunch stops allow time to stretch and explore fascinating places on shore. Join us for a professionally guided day trip to experience the best of Kyuquot at water level! Includes delicious lunch, kayaking gear, instruction, interpretation of natural and cultural history, & fun! Boat transport from Kyuquot at 08:15, returning at 16:30. Please inquire well in advance!